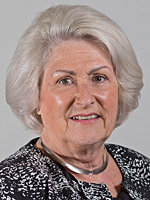 Brenda Smith has been a Crawley Borough Councillor for 31 years and has been a West Sussex County Councillor for eight years. Previously living in Ifield, she now lives in Langley Green. Brenda is the widow of Alderman Jim Smith MBE JP. She enjoys spending time with friends and her large extended family of children, grandchildren and great-grandchildren. She is a Dementia Ambassador in Crawley and enjoys Town Twinning with Dorsten in Germany. Brenda is passionate about Crawley, takes part in a local Scouts group and is a retired Road Safety Officer.